Once upon a time, there was powerful rhino that could transform into a ball of spikes but hated magic... Well, you probably know where this is going. Once upon a time, there was powerful rhino that could transform into a ball of spikes but hated magic... This is his story. The Drill Sye is a Dream Eater in Kingdom Hearts 3D: Dream Drop Distance. 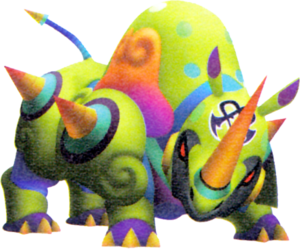 The Drill Sye resembles a large Indian rhinoceros, and as both that fact and its name would imply, it has one very large drill-like horn which it uses to charge at enemies. The second half of its name means "rhinoceros" (犀, sai?) in Japanese. Its Spirit form is colored in various shades of purple, green, pink, yellow, and orange, and also has a pale yellow face and slit yellow-orange eyes. It has the Spirit version of the Dream Eater emblem on its forehead. In addition to a horn, it also sports four small spike-like drills, two on both the left and right side of its body. 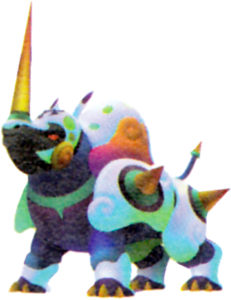 The Nightmare variation of the Drill Sye has a dark face with the Nightmare version of the Dream Eater symbol on its forehead. 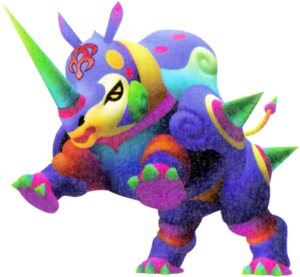 Unlike its Spirit counterpart and a certain majority of Nightmare Dream Eaters, its body is primarily light in coloration, sporting a large yellow body, an orange horn and orange drill spikes, and various shades of blue and red. It also has red eyes, a trait that it shares with the rest of the Nightmare Dream Eaters. ↑ 1.0 1.1 1.2 1.3 Becomes available after unlocking Secret: Green at C-3. ↑ 2.0 2.1 Becomes available when in Destroyer disposition. ↑ 3.0 3.1 Becomes available when in Drill Sarge disposition. Sora can obtain the Drill Sye Recipe from the second Special Portal in La Cité des Cloches. The Drill Sye can be created through six different recipes. The second recipe is a rank C recipe. The third recipe is a rank B recipe that has a 20% chance of transforming from Pricklemane. The sixth recipe is a rank A recipe that has a 60% chance of success.